The Week in HD - Monday 7th January | What Hi-Fi? Welcome to The Week in HD, our guide to all the must-see TV shows, films, sports and Blu-ray releases to grace your screen over the next seven days. Two great documentaries hit Blu-ray this week. 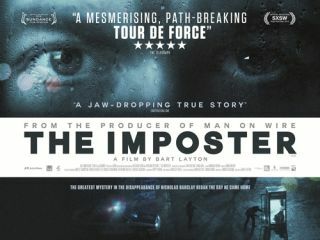 The Imposter is a riveting tale about a French man who impersonated a missing American schoolboy. Crossfire Hurricane is an intimate chronicle of the Rolling Stones' early years and rise to mainstream success. New series: Michael Portillo continues chugging his way around the country, this time from High Wycombe, Buckinghamshire, to Stratford-upon-Avon in Warwickshire. New series: episode 1 of 3. Wildlife filmmaker Gordon Buchanan gets as close as he can to a family of polar bears. See what happens when a bear tries to break a Perspex cage. Season 3: episode 1 of 6. Dara Ó Briain and Professor Brian Cox examine the search for life on Mars, and look at the latest findings of the Curiosity Rover. Phill Jupitus and Marcus Brigstocke go and play on Bolivia’s infamous Road of Death. Their goal is the ancient mountain city of Potosi, almost 5000 metres above sea level. Season 6: episode 9. Stephen Fry and Alan Davies say interesting things about film and fame. Today’s guests: Emma Thompson, David Mitchell and John Sessions. Season 17: episode 6. Jeremy Clarkson and James May drive to the seaside in new electric cars, while Richard Hammond meets an extraordinary rally team. Part 1 of 2. Scientists explore the inside of a glacier, and a multi-million-ton block of ice falls into the ocean. Django Unchained is out soon! Quentin Tarantino talks about his latest (inevitably wacky) creation with Graham Norton. Also on the couch: James McAvoy, Alan Davies and Emeli Sandé. Kirsty Wark and guests dissect the new year’s artistic highlights, including the film version of Les Miserables. Swashbuckling adaptation of the classic tale with Eddie Izzard, Elijah Wood and Donald Sutherland. If The Hobbit wasn’t enough Peter Jackson for you, check out this 2005 epic with Naomi Watts, Adrien Brody, and a giant ape who beats up dinosaurs. Season 1, episode 3: David Attenborough’s examination of the Galapagos islands’ wildlife continues. The star of the week: a giant tortoise called Lonesome George. Clarissa Dickson Wright tries to get us cooking rabbits again, while Gregg Wallace plays with raspberries. Somebody takes something from Liam Neeson again, and this time it’s his identity. He doesn’t like that, not one bit.